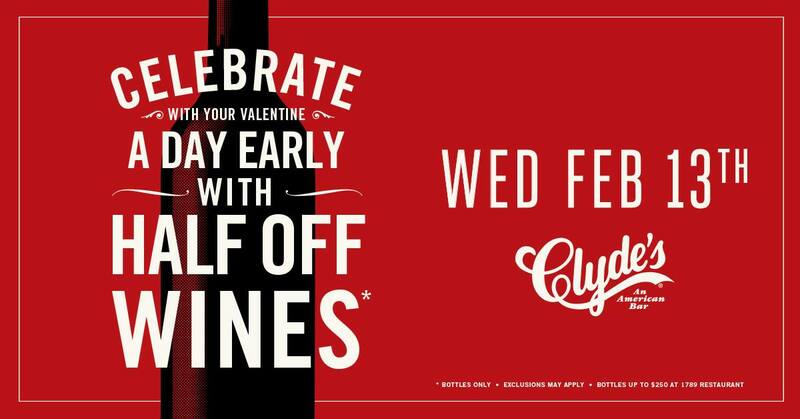 “Our wide range of use makes Clyde’s perfect for holidays, there is something for everyone,” Meyer continues, “Some people want a nice steak dinner, oysters, and wine; and we have that, but some people might want a burger and wings. We can accommodate that, too." At Clyde’s locations, the full list of wines by the bottle list is available. At 1789 Restaurant, the discount applies to wines up to $250 per bottle. The promotion is available all hours on February 13th as permitted by local law. 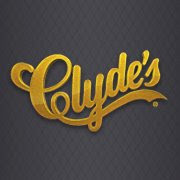 Clyde’s Restaurant Group (CRG) is one of the nation’s most successful, privately-held restaurant companies. 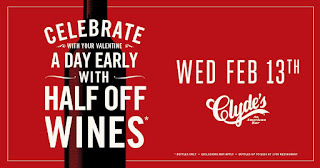 In 1963, the original Clyde’s opened in the Georgetown neighborhood of Washington, DC. and was recently recognized as one of the city’s “Top Workplaces” by The Washington Post. The brand has expanded to include 13 properties in Northern Virginia, suburban Maryland, and the District of Columbia: Clyde’s of Georgetown, Clyde’s of Columbia, Clyde’s of Reston, Clyde’s of Chevy Chase, Clyde’s at Mark Center, Tower Oaks Lodge, Clyde’s of Gallery Place, Clyde’s Willow Creek Farm, Old Ebbitt Grill, The Tombs, 1789 Restaurant, The Hamilton, and the recently-opened music venue, The Soundry. All of Clyde’s restaurants, while distinctively different than the next, share the same reputation for exemplary customer service and a chef-driven menu featuring high-quality fresh ingredients. All Clyde’s concepts share a commitment to the people and the region they serve, proudly offering local produce, seafood, farm-raised meat, and air-chilled, hormone-free, antibiotic-free, humanely raised chicken. A person's point of view or general attitude to life. DC Outlook is your guide to staying busy in the nation's capital. Discover the city's best in film, food, music, sports and all things entertaining. Hungry? Click here for the Cafe Menu. Click here to sign up for ArcLight Membership. Benefits include discounts, FREE popcorn upgrades and a FREE ticket on your birthday! Click here to download the app from the (Apple) App Store. Click here to download the app from Google Play. April 25: Mary McDonnell's Class Act: From Dances with Wolves to "Major Crimes"